Kayaking around the caves in La Jolla is one of the best ways to explore the beautiful coastline, see marine wildlife up-close, and even swim in some of the caves. Be warned: you will get wet! But don’t worry, you'll soon dry off back on land. It’s also guaranteed to be one of the most fun arm workouts you've ever done. For a very urban area, San Diego offers plenty of parks, green spaces and trails, all of which are just itching to be explored. 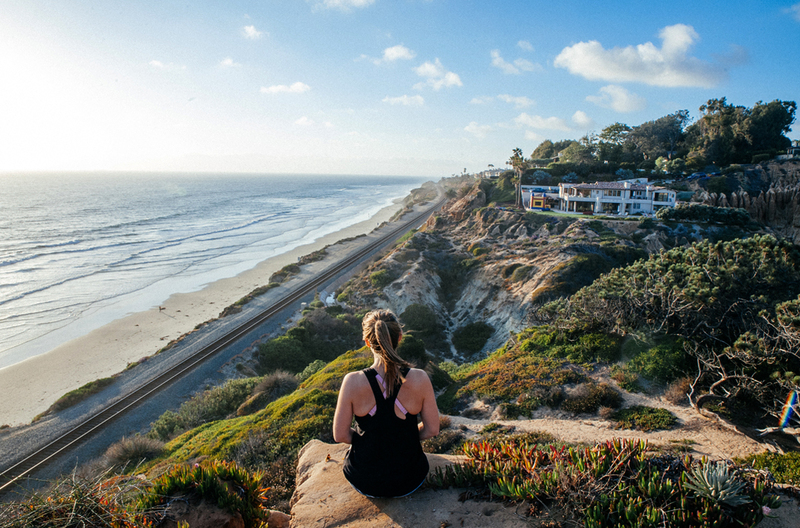 Hiking through Torrey Pines State Reserve, Cabrillo National Monument, Sunset Cliffs Natural Park at sunset is the perfect ending to an action-packed day. All that’s left is to reward yourself by gorging on the local cuisine. Bike tours are a great way to explore outside of the San Diego. There's the option of sightseeing, summiting Mount Soledad, exploring the culinary options and shopping on offer. And with electric bikes available, there's something to suit all tastes and fitness levels. Where to run and workout? San Diego has some very trendy global fitness studios, including F45, Pure Barre, Orange Theory, and Barry's Bootcamp, alongside local favourites Belle & Barre, SparkCycle, Trilogy Sanctuary. So, if you want to kick start your day with a workout, or simply balance out the Salt & Straw ice-cream, you can get your sweat on in whichever way you prefer. Be prepared to see alot of Lululemon in SoCal. You can get in on the action and workout for free at their San Diego location. Keep an eye on their Facebook page for regular workouts and one-off events. 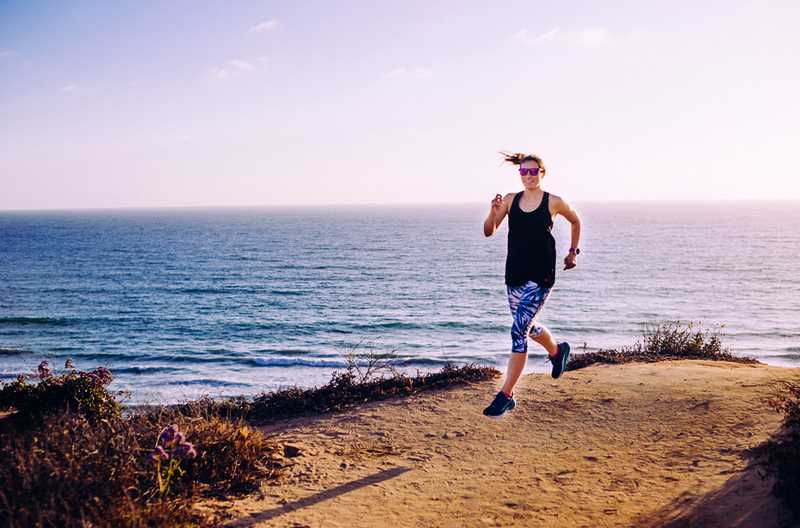 Run along the beach at Torrey Pines State Reserve at sunset for a truly Californian experience, or take advantage of the flat waterfront in downtown San Diego (although you might want to head out early to beat the tourists). Taking your training seriously or just want to hit the track? The track at Point Loma Nazarene University is open to the public (if it isn’t being used by the sports team). Join the group. San Diego Track club meet at Balboa park on Tuesdays at 6pm for hill workouts. They say misery loves company… Alternatively, join a running tour of San Diego with City Running Tours to learn on the run and see a side of SD reserved for the locals. Cafe Gratitude, situated in Little Italy, is the perfect spot for any health lover. Serving plant-based breakfast, lunch and dinner with a side of contemplation and reflection. Situated within Fashion Valley Mall, True Food Kitchen is the ideal post-shopping refuel, offering bowls, tacos, pizzas and salads that will give you that second wind. Heads up, there's a new Lululemon opening at the Mall this Fall. You're welcome! The San Diego area is famous for its great Mexican food, and both Puesto and Evolution offer healthy versions of the classics. Most restaurants offer great deals on Taco Tuesday, or a version of Happy Hour between 5-7pm that isn't to be missed. Ice-cream shop Salt and Straw, whilst not technically 'healthy', is a must for any San Diego visitors. You can taste up to three flavours before making your final selection (with a huge variety of options, this is highly recommended). All in all, would I recommend San Diego? Let’s just say that if I go missing from the Berkshire town I call home, you’ll know where to find me! Charlie, aka The Runner Beans, is a travel addict, fitness enthusiast and marathon chaser (she’s run marathons on 4 continents). She’s visited 26 of the 50 states and counting, and jokes that she married her husband for his travel perks (he’s a pilot! ).